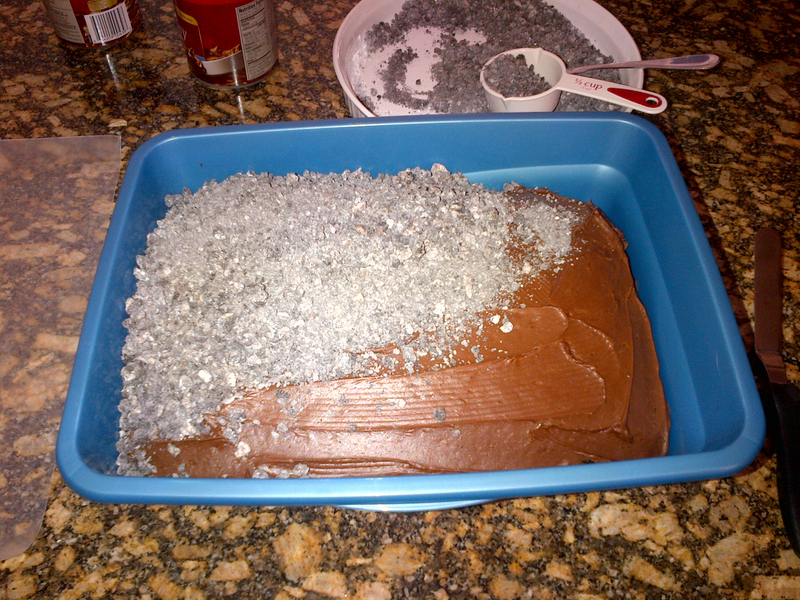 ‘How-To’ Litter Box Cake: Happy Barfday and Prank You Very Much! Would you eat this? We did! Following gagging and a few laughs, Mitchell and a few of his friends dug in and enjoyed the rich taste and complex flavors of this litter box birthday cake — the perfect way to cap a 14-year-old’s annual celebration! Bake a 13″ x 9″ cake using 1 or 2 boxes of cake mix — flavor doesn’t matter as the cake isn’t seen until it’s served. We used 1 1/2 boxes for a more full final litter pan, and to allow us to reserve some batter for a dozen cupcakes — in case one of our guests was too grossed out to eat the litter box cake. Let the cake cool for about 10 minutes before transferring to a wire cake rack to finish cooling. Once completely cool, transfer again into a BRAND NEW, CLEANED plastic litter pan (we found a 13″ x 9″ pan for $1.97 at Wal-Mart, along with a new scoop for $.94). 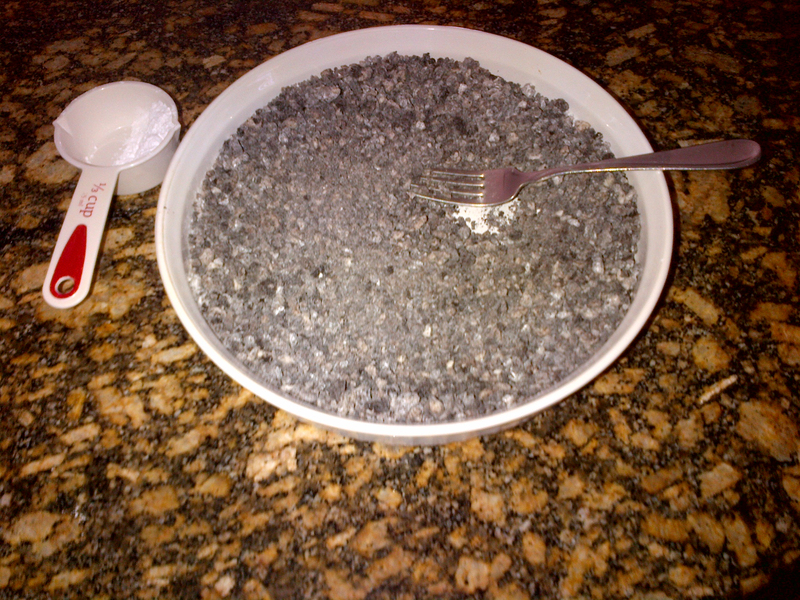 Ice the cake, again using any flavor of your liking, as the “litter” mix will completely cover the icing. 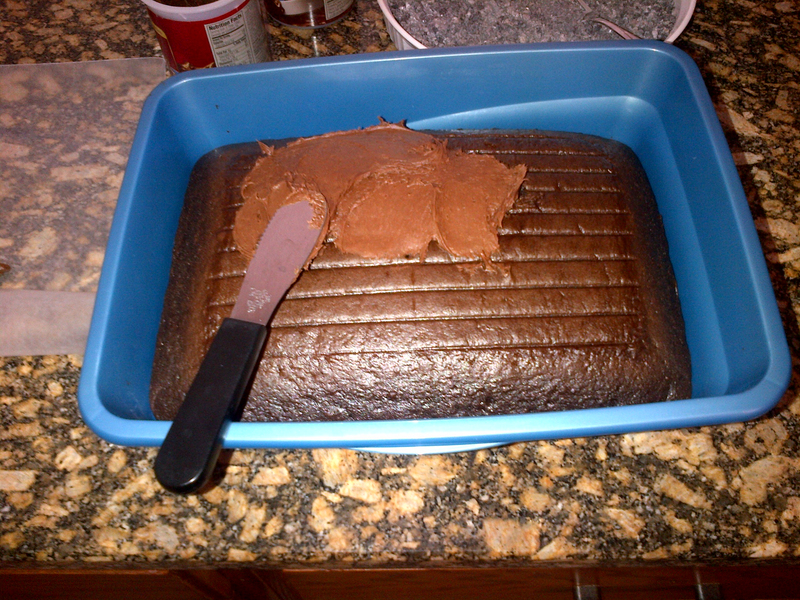 The icing is important for flavor, and to help the “litter” stick to the cake — so use the entire can! 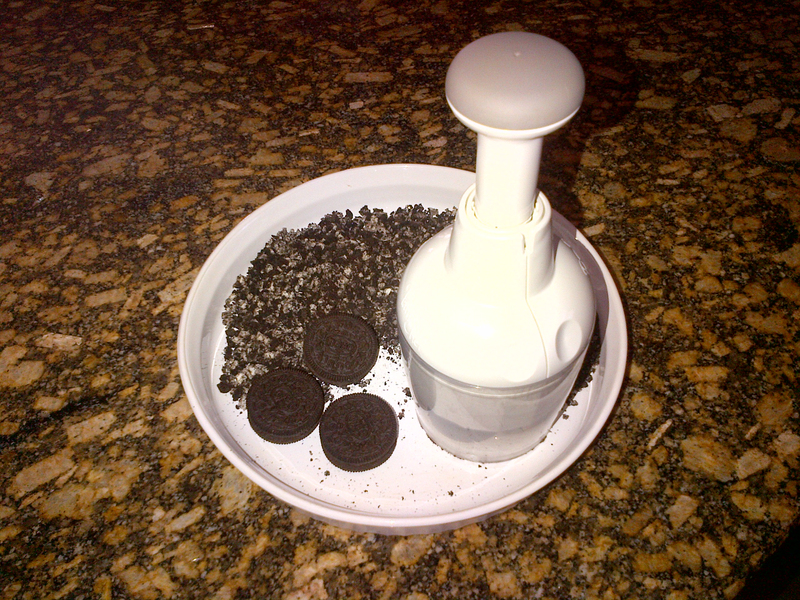 To make the “litter,” start by using a chopper to mash up sandwich cookies to the approximate consistency of litter. We used Double Stuf Oreos — for the color, and because that’s our son’s favorite sandwich cookie. 20 cookies was the perfect amount. Using a vanilla-chocolate cookie introduces yellow color to the mix — something we’d seen in other online recipes, but something we wanted to avoid — but because the Oreo mix was too dark, we evenly stirred in powdered sugar — 1/3 cup — to the mix. Spread the mix across the iced cake; it doesn’t have to be even, but do strive to cover all the icing — there should be plenty of mix for this. 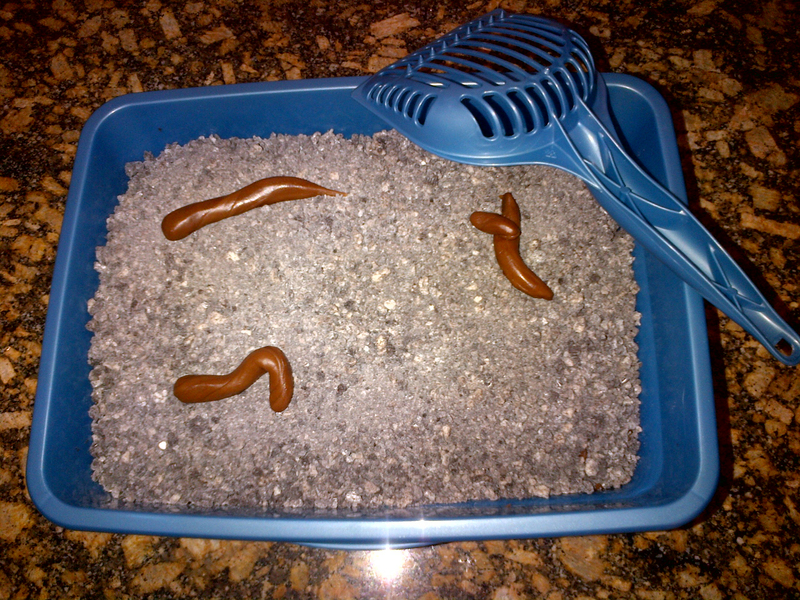 To simulate “cat turds” in the “litter” — essential for realism and maximum gross-out — heat a few Tootsie Roll Midgees in a microwave for about 15-20 seconds — just enough to soften them. 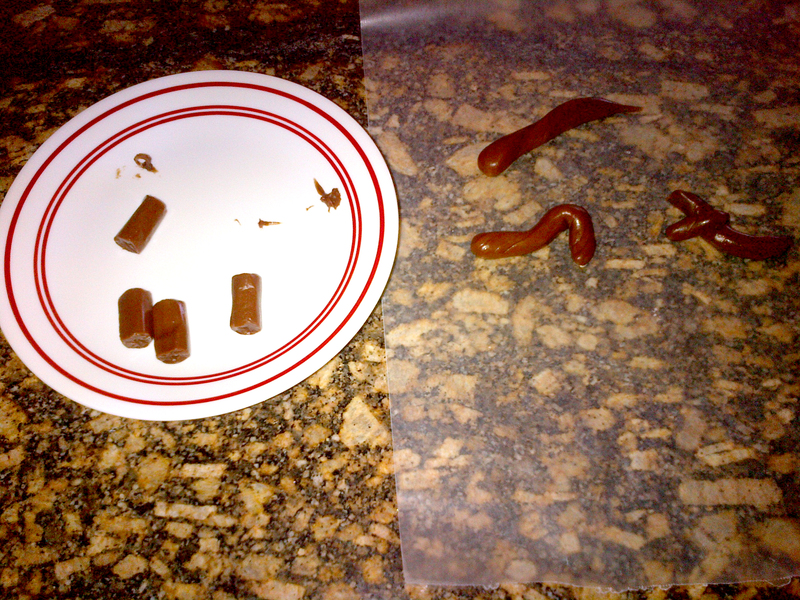 Using 2-3 Midgees per “turd,” mold the Tootsie Rolls into shape. This is more art than science, but frankly it’s very difficult to go wrong here! Place the “turds” in the “litter” and voilà! The effect is complete! Be ready with a camcorder when you serve this one up! If you give this a try, let us know how your kids like it! ~ by Random Handyman on February 2, 2013. I just made this for our “puppy’s first birthday” – because the litterbox IS her favorite treat. Can’t wait to see the kids’ reactions tomorrow!